Meals are a large part of your daily life, and exquisite food helps create memorable experiences. At Waltonwood Cotswold, our premier dining services offer a unique combination of healthy eating and fine foods, all prepared by our skilled culinary staff. We are dedicated to ensuring unforgettable dining experiences that meet your dining and nutritional needs, without the hassle of meal preparation. Dining at Waltonwood is a sophisticated experience, complete with a warm and inviting ambiance that’s perfectly suited for indulging in your favorite foods, and discovering new ones. Our gourmet meals are prepared by professional chefs with the highest quality of ingredients and care, and we work to create seasonal menus that will suit your needs, without sacrificing taste or variety. Our chef’s creations are delicious, nutrient-dense meals that are tailored to our residents’ needs. We incorporate locally sourced foods into our meals, and encourage culinary chats with kitchen tours to promote further kitchen transparency. Restaurant-style dining — Rather than limiting residents to a couple of standard entrée choices, we now have a menu that we rotate with the changing seasons, in addition to our daily menu selections. 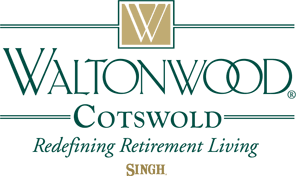 Exclusive chefs and hospitality professionals — In 2017, Waltonwood Cotswold added a pastry chef to our culinary staff, specializing in upscale creations that include crème brûlée and fruit cobbler. Food as entertainment — In addition to our specialty pastry creations, we offer at-table food preparation as an entertainment service for our residents. I was born in Umeå, Sweden which is about 600 Miles and 7-hour drive straight north of the capital Stockholm. My interest in food started at a young age, we often times had large events and celebrations at my house where my mum cooked 7-course dinners from all around the world. I remember that in the beginning of 5th grade I asked my Mum, if I could help her out in the kitchen, and after a long day of Walpurgis Night’s preparations, I told my Mum , I really liked working with food and said :“ I think I want to be a Chef ”, Mum then said: “Well If you know how to cook, learn a couple of languages and learn hospitality and etiquette, you will always have a job, never be hungry and you can travel the world like you always wanted “ Mum was right. 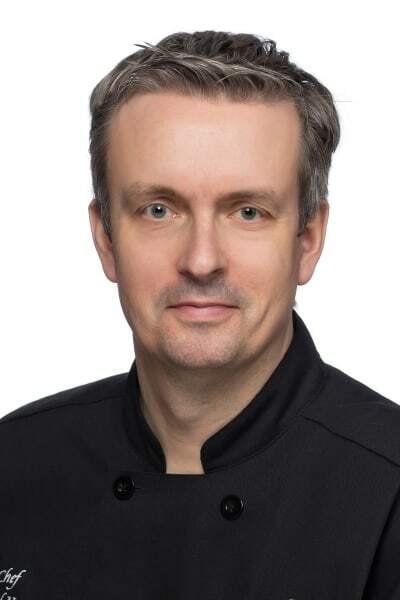 I started my culinary journey and career in 1986 working many Fine Dining Restaurants, 5 Star Hotels and Cruise Liners and public event centers. Two years of service with the United Nations Peace Corp as a Chef in Lebanon and Bosnia Herzegovina. On June 6 2001 Sweden’s National Holiday I officially emigrated to U.S.A Within last 16 years, I spent 4 years at a Historical Hotel and the rest of the time, I worked inside contract dining management for Business Corporations, Museums, Sports Arena’s and Hospitals. I love the Waltonwood Family philosophy that we are in the business of “Redefining Senior Living”. What I personally love about food is that brings people together like no other element and it does so many different things to the social tapestry, crossing all borders, languages, cultures, family traditions and diverse taste buds. The Social daily interaction with Residents gives a added value to your workday. I am looking forward to welcome all of you home to our Waltonwood Family here in Cotswold.